Algaefix solves the most common problem for the pondkeeper and fountain owner, unsightly green algae growing on surfaces and clouding and turning water an ugly green. Before Algaefix, other algaecides had major drawbacks. They killed the algae but they killed or damged the pond plants. Algaefix is an EPA registered algaecide and the first selective algaecide that is safe for use with both live plants and pond fish. 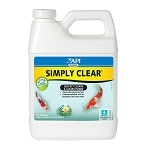 Fast-acting Algaefix effectively controls green water algae, string or hair algae and blanketweed and has been used successfully by pondkeepers for over 8 years. It is the leading brand of pond and fountain algae control.